For this week's installment of Music Mondays, I'm takin' us back to the early 90's. We'll be listening to Tupac Shakur's Keep Ya head Up. I picked this song for a couple of reasons. First, I really like it. 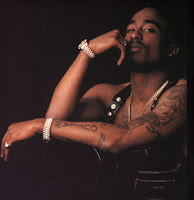 Second, Tupac has a reuptation to many as a "gangsta rapper." He was that, and he did a lot to popularize that genre. He was also a social commentator, and this song is a really powerful anthem about continuing your struggle in the face of adversity. As always, I suggest you follow along with the lyrics. You can find them here. You wanna hug it out?